The Internet of Things (IoT) is everywhere … literally. You can’t shop, eat out for dinner, get your oil changed or even walk down the street without seeing a smartphone, tablet or some other Internet-connected device. Yes, IoT devices are mainstream. Practically everyone has one. So, you might be wondering about all the explosive growth that analysts, including our own IoT guru Paul Mampilly, keep talking about. After all, if you caught the IDC’s wearables report over the weekend, you might be more than a bit concerned about growth in the sector — especially for U.S. manufacturers. Specifically, IDC’s data showed that leading wearables maker Fitbit saw its market share drop nearly 23% year-over-year in the fourth quarter. Furthermore, competitor Garmin also saw its market share decline by 4% for the same period. Apple was the lone domestic standout, banking a gain of 13% following the best quarter on record for the Apple Watch. As you can see, the IoT is far from lacking in growth. 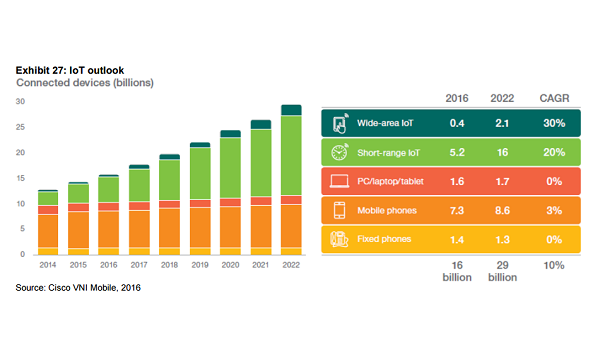 The number of connected devices is expected to nearly double to 29 billion by 2022, with smartphones only accounting for about 3% of that growth. Much of the rest will come from short-range devices such as connected refrigerators, in-home thermostats, smart watches, and home security and power management devices — think Google’s Nest. Surprisingly, however, the biggest avenue for growth for IoT devices is through wide-area connectivity. These are your less obvious Internet-connected devices, like those used by your local power and water providers to monitor substations and water mains. These are also the IoT devices driving the cars of the future, like Tesla’s much talked about autopilot feature. The bottom line is that IoT devices such as smartphones and wearables may be nearing mainstream market saturation, but there is still a wealth of room for growth within the market as a whole. Thinking of Snapping Up Snap?